Hi there, I’m Heather, owner of Heather Scott Home & Design, a turn-key interior design firm and retail boutique in Austin, TX. 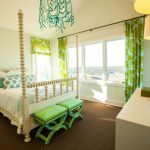 I am excited to guest post for Erin and share one of our projects (with punches of turquoise of course) with you. I hope you enjoy! 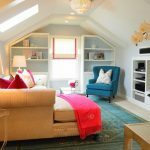 My team recently completed a fun project of furnishing and decorating a small bedroom for a couple of young ladies and their frequently visiting friends. The tiny bedroom shared by two young girls left the mom stumped. 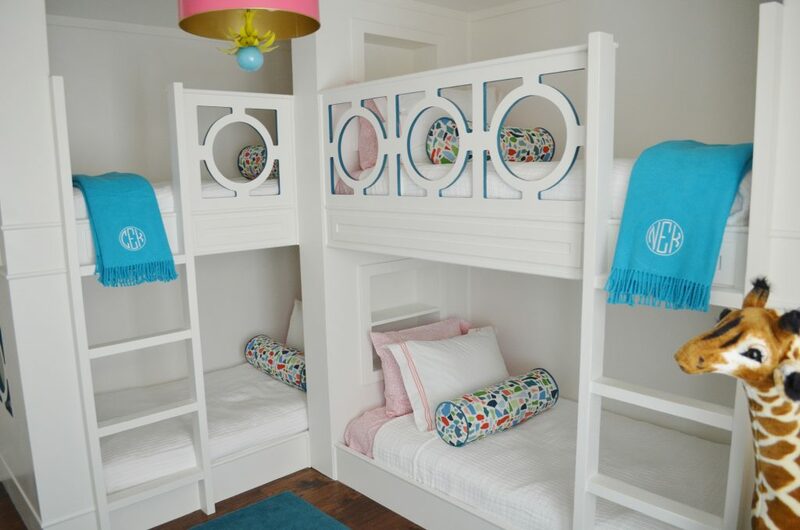 Now this small room packs a punch with four twin beds in bunk style! Perfect for hosting sleepovers, might I add. Mom requested (and had the girls approve) a white color scheme with some pops of turquoise, coral, teal and fuchsia. The girls are growing up fast, so she requested a scheme that was not too childish and would transition with them as they go into their teens. Tiny accents of turquoise keep the room from being ‘too’ white. A teal rug makes for a soft spot to hang out in the middle of the room. 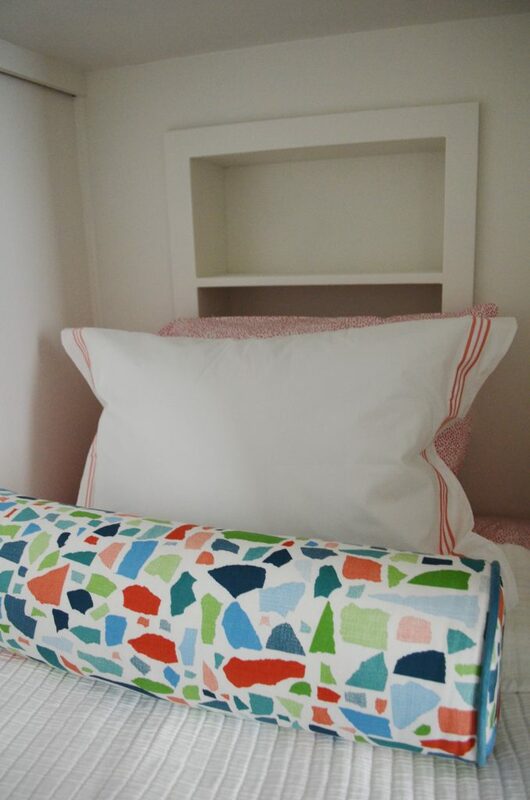 Easy washable bedding pulls in corals and white. 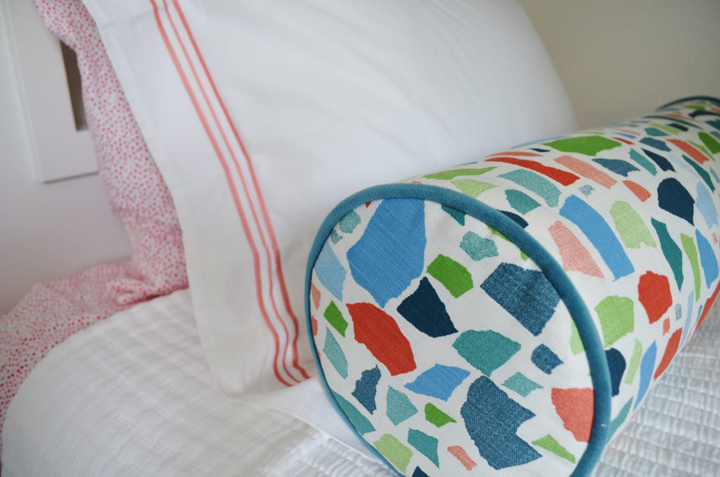 Neck-roll pillows in colorful, confetti style fabric add an element of pattern to the white coverlets. Each bunk also got recessed storage for books, photos, trophies and mementos. Also, to save space mom said it was time to clear out the toys and narrow down the stuffed animals so we did not have to plan on display or storage space for those. 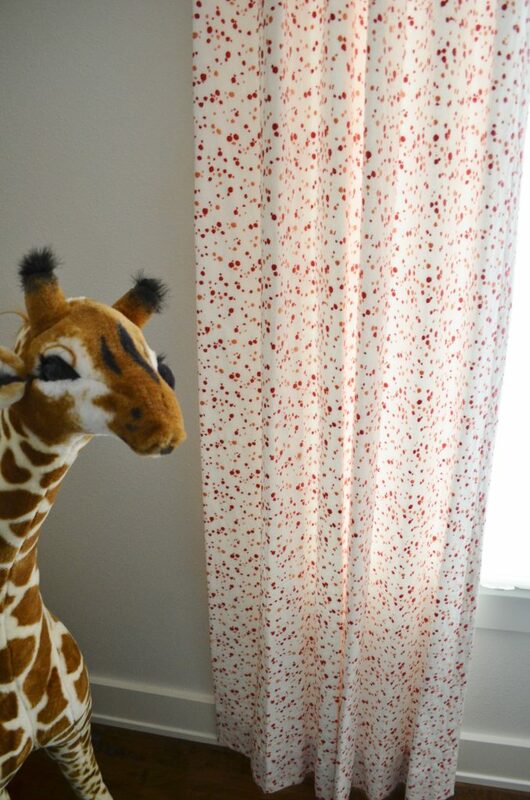 But we did keep the 40″ giraffe in the room! The drapery panels continue the confetti look with a embroidered pattern in coral and pink. 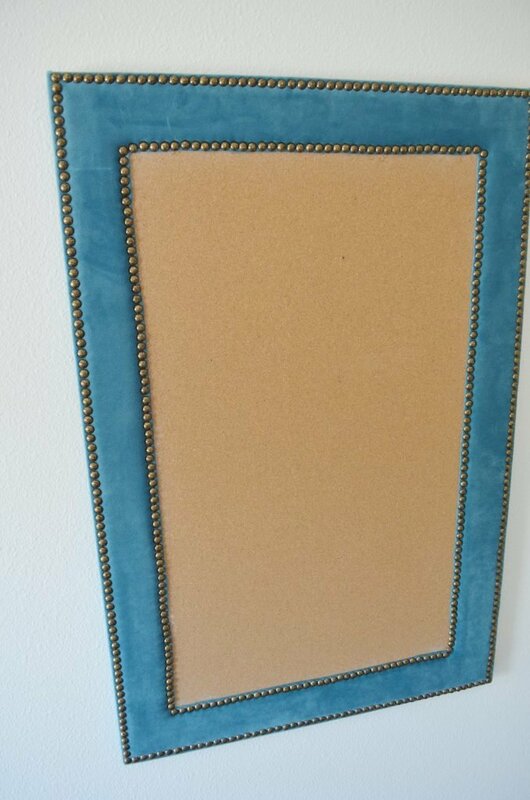 We had a cork board made for the girls in a durable teal velvet as a way to corral photos, ribbons and recognition certificates. 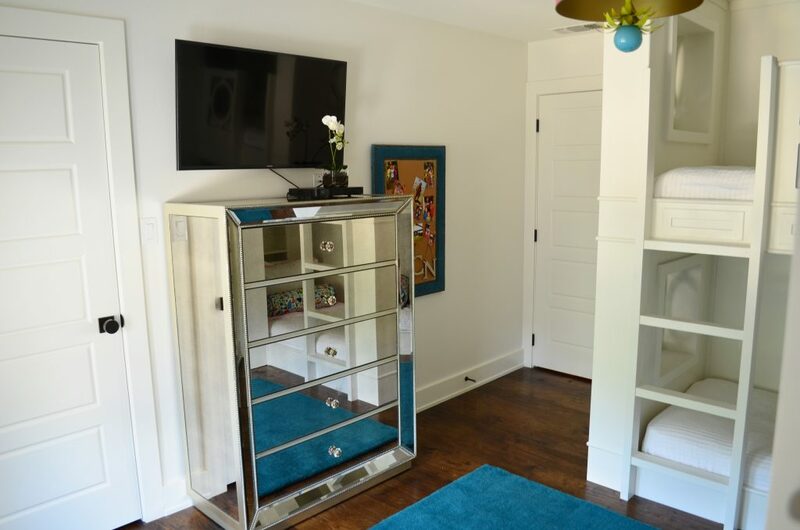 A mirrored dresser helps to visually ‘expand’ the room and provides additional storage for the girls. The best part: happy clients!! It did not take long for the girls to settle in and start enjoying their new room! 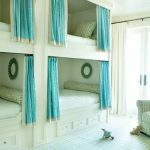 Kids’ rooms are so much fun to decorate and the joy they get from having a space they can call their own is a great reward! We would love to help you, and your kids, have a space they can call their own. Thanks for letting us share one of our projects with you. Visit our blog or follow me on Instagram to see more! Too Cute Heather! 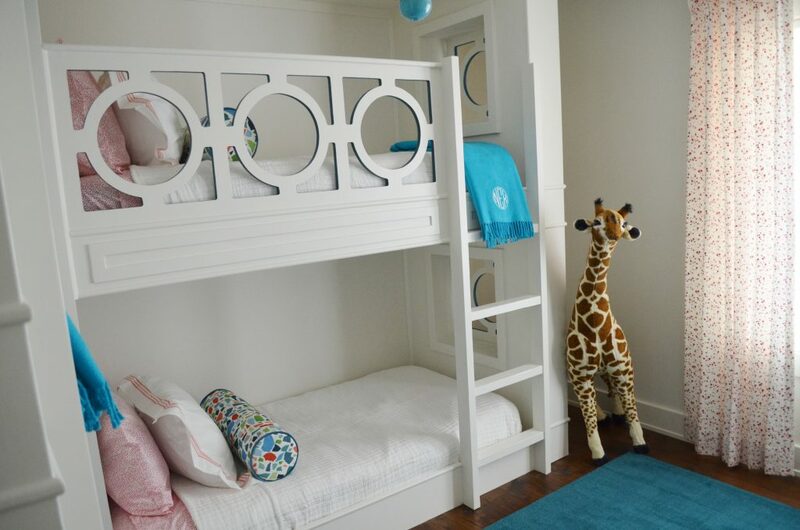 I love the details and the bunks espically are so cool! Thank you! Youve got a great eye!